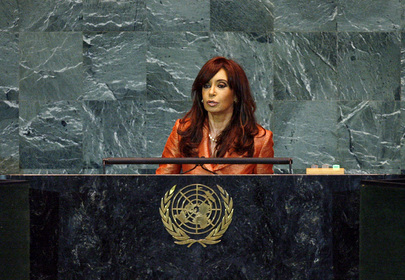 CRISTINA FERNANDEZ DE KIRCHNER, President of Argentina, said she had meant to begin her statement with a strong appeal for the need to rebuild multilateralism and cooperation in order to overcome the current socio-economic crisis. Some developments, however, had led her to begin with the situation in Honduras, where the power at her country’s embassy had been cut off this week, as the protests and marches in favour of a return to democracy were going on in the country. The embassy of Brazil had had its electricity and water cut off for having given shelter to the constitutional President of Honduras. It was crucial that the international community became aware that its failure to design a strong multilateral strategy to return democracy to Honduras would set a very serious precedent in the region. She called upon nations to safeguard the basic values of democracy and respect for human rights in the region. Multilateralism meant understanding that it was necessary to set common and general rules in the world that must be accepted by all countries, she said. Defining multilateralism would require concrete actions by all the players under the same parameters. For instance, the only possibility of successfully tackling climate change required setting common rules for addressing the problem, for both developed and developing countries. Another issue that pointed to the need to look at multilateralism as not just a rhetorical statement related to the Malvinas, which still could not achieve sovereignty -- a principle that had been proclaimed by the General Assembly on many occasions. In connection with the bombing of a Jewish community centre in Buenos Aires in 1994, she also reiterated her country’s request for the extradition of several Iranian officials who were sought by Argentina -- not to be sentenced, but to be investigated and tried, enjoying all the freedoms and guarantees granted by democracy. This year, one of the officials whose extradition had been requested had been made a minister. Today, the Assembly would hear a statement by the President of Iran, who would perhaps deny the tragic events of the past and would certainly mention the threat of imperialism and invoke the name of God. Her country was not an imperialistic country. On the contrary, it had suffered the effects of colonialism. Like the President of Iran, she believed in God. Among the positive developments, she mentioned a recent visit of an Inter-American Commission on Human Rights to Argentina, 30 years after its first visit, to investigate the crimes committed by the dictatorship. She also spoke about a bill to the Congress of Argentina to eliminate the crime of libel against journalists -- a measure that would promote the freedom of the press in the country. As a member of the G-20, which would meet tomorrow, she also asked for the voice of another multilateral forum to be heard -- the International Labour Organization (ILO). Workers and businessmen were real stakeholders in the efforts to reactivate the world economy, and their opinion should be heeded. In conclusion, she stressed that democracy, human rights and similar rules for all the countries of the world were the keys to building new multilateralism. It was clear that those with more responsibility and power also had the obligation to exercise that leadership in a responsible manner. That was what developing countries were asking for.